Getting lost in the branches? 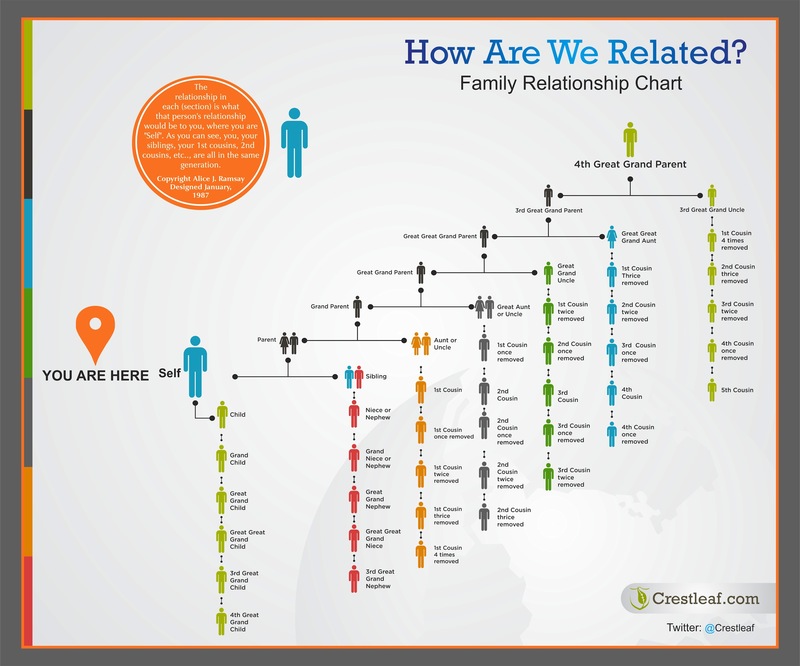 Here’s a handy relationship calculator from the team at Crestleaf to help you work out your family tree. I often get emails in response to my website or this blog, or through sites like Ancestry, from distant relatives. Naturally I am fascinated to work out the relationship between us, but it can be really tricky to do so. Probably like a few of you this long Easter weekend, you’ll be spending time with family, and inevitably talking about ‘the tree’. My mother often asks if i’ve discovered anything new, but I often watch her eyes glaze over as she gets lost after about the third step when I’m trying to describe how one of those distant relatives is related. Print it out, pin it, stick it your fridge, or save it to your iPad (i’ll be doing that for Who Do You Think You Are? Live in a couple of weeks). You can right click the image above, or download it (588Kb) here.